Just like last week (https://throatpunchgames.com/2015/01/11/blurbs-from-the-booth-top-10-reviewed-games-of-the-2014/), I feel it’s time to go over the top ten RPG products I reviewed in 2014. Same rules apply-I need to see your product AND review it in 2014. Want your favorite or your product up here? Get me a copy! Emergence RPG reviewed here https://throatpunchgames.com/2014/08/07/ring-side-report-rpg-review-of-emergence-roleplaying-game/ Did you like Guardians of the Galaxy? How about a whole society of humans who emerged on to a planet in the 1980/1990’s with Orcs, Dwarves, and Elves? Only thing I want more of is content for this RPG. Numenera RPG reviewed here https://throatpunchgames.com/2014/01/18/ring-side-report-review-of-the-numenera-rpg/ Numenera or The Strange was ending up on this list one way or another. The wife made the call for me as I’ve run both for her, and she wants more Numenera. It’s got quick character building, extremely fast combat, and a very intuitive skill/combat system. Crawl! Issue #10 reviewed here https://throatpunchgames.com/2014/08/27/ring-side-report-rpg-review-of-crawl-10/ I love DCCRPG. I run one game a month and one con game a month. I AM STARVED FOR OFFICIAL PLAYER CONTENT! However, if I can’t get my official fill from Goodman Games, there is always Crawl! ! (That’s intentional Crawl! has an exclamation point.) This issue was the demi-humans issue. You want that Halfling rogue? You got it! Also, this is the cheapest thing on this list at three bucks! AMP: Year One reviewed here https://throatpunchgames.com/2014/10/17/ring-side-report-rpg-review-of-amp-year-one-and-attack-of-the-buzz/ How about the X-Men? Well, there is no official RPG anymore for the X-Men, but there is AMP: Year One. Mutants super heroes with crazy powers and customization makes a great RPG. BareBones Fantasy Reviewed here https://throatpunchgames.com/2014/06/02/1924/ A short simple RPG that plays fast. I love quick systems, and this one is short and to the point. All characters are made quickly and the game plays even quicker. Also, the books are CHEAP and they look like graphic novels! Victoriana 3rd Edition reviewed here https://throatpunchgames.com/2014/11/19/ring-side-report-victoriana-3rd-edition/ Why yes I love Shadowrun, Steampunk, and forcing my players to have to choose what happens when they push themselves. Here is a system that does all of that in spades. Also Cubicle Seven proved how classy to me they are by releasing the update to their Lord of the Rings RPG for FREE. Great content and guys/gals all around. Run and Gun for Shadowrun 5e reviewed https://throatpunchgames.com/2014/04/24/ring-side-report-rpg-review-of-run-gun/ I love me some SR, and options was what any player really wanted in 2014. And options are what we got. It’s not everything we could hope for, but it was something big! Darkwood Adventure Arc #1-The Deft and the Deadly reviewed here https://throatpunchgames.com/2014/06/06/ring-side-report-rpg-review-of-the-deft-and-the-deadly/ Pathfinder needs a spot on this list, but this isn’t from Paizo. I really like what these guys are up to. They’re making a brand new world, and this book not only describes a small adventure but is part world guide. Great bargain for less than 15 bucks! 13 True Ways Reviewed here https://throatpunchgames.com/2014/07/31/ring-side-report-dual-rpg-review-of-13-true-ways-and-13th-age-bestiary/ 13th Age is one of my favorite RPGs to come out recently, but if Catalyst is somewhat quite, Pelgrane Press is downright mute on new content for its RPG. 13th Age players want options, and this book gave them plenty. From the monk that made me super happy with proper martial arts forms to just tons of new content, I love this book. Dungeons and Dragons-5th Edition- DM Guide reviewed here https://throatpunchgames.com/2014/11/30/ring-side-report-dungeon-masters-guide/, Monster Manual reviewed here https://throatpunchgames.com/2014/08/26/ring-side-report-rpg-review-of-dungeons-and-dragons-monster-manual/, and Player Handbook reviewed here https://throatpunchgames.com/2014/08/19/ring-side-report-rpg-review-of-dungeons-and-dragons-players-handbook/. No surprise here. It’s the game I play the most if you follow my twitter. WotC had one of the cleanest launch products I’ve seen in a while. It felt classic and new at the same time. Well done! Had a new player love Shocking Grasp, but hate to have to get close. How about something similar, but not overpowered? You lob a ball of pure electricity at a target. Make a ranged spell attack against the target. On a hit, the target takes 1d6 electric damage and can not take reactions for the next turn. Practice safe matrix activity, always use Paladin(TM) brand overwatch! Sometimes you can’t protect all your friends gear at once. Sometimes your friends get hit, and then they wine later. With Paladin(tm) running, your friends reduce all hits dealt to their matrix gear by one box if you have those PAMs slaved to your deck or RCC. Time for a three part review! Shadow, Sword & Spell-Basic, Expert, and Threats! Basics– How about some good, old fashion pulp fantasy! Shadow, Sword & Spell is an old school RPG with some new mechanics and a serious side of Conan. It’s a simple system, but simple in a smart way. It’s also human focused. Let’s look at the first book, and possibly the only book, you need to run the system-Basic. Base Mechanic- This system used a 2d12-based, roll-under system for all tasks. Basically, for any given task you determine an attribute from your character (like brawn for swinging a sword) and a skill (melee for the sword) and add those two numbers together. That’s the number you need to roll under on two twelve sided dice. All tests are resolved this way. Its quick, it’s easy, and I’ve just taught you the entire system in 30 seconds. Degrees of Success– From above, you need to roll under a target number. BUT, what I really like about this system is the degrees of success really matters. In your standard DnD Game, hitting the orc with a 10 on the d20 really doesn’t change how dead the orc is compared to a rolling a 15. However, in this game, you count how far under the number you needed to roll. If your opponent wants to dodge the attack, he/she/it rolls under its quickness and dodge scores, and counts the degrees of success (if any). The target’s successes are subtracted from your successes, and if you still have hits, you hit the target and that number of net hit is multiplied by the weapon damage of your weapon. This system uses NO other dice. Thus, a hard hit is one where you are way below your own target number and they completely flub their defense roll. It’s interesting, almost as if you run the race against yourself. I like that a really good roll has a really good result. This works for everything from sword fights to battles of wits with the king. Magic-It wouldn’t be fantasy if it didn’t have magic. And it wouldn’t be pulp if magic didn’t cost you something! In Shadow, Sword & Spell, all magic will cost you some vitality (hit points), and some will cost you sanity. Just like before, it’s all roll under your proficiency with a spell, compare your successes to their successes, and do an effect. Unlike before, that magic system here is cast till you pass out. You cast a spell, you lose some life. Keep going, and you might kill yourself! I love that in a magic system! The magic is broadly divided into two different categories: common spells and alchemy. Common spells are the magic you know and love that will rain fire or heal your friend. Alchemy is your potion brewing, elixirs, and poisons. Hooks and Story Currency-Lately I’ve been on a kick of giving some narrative control to my players. I love ideas like hero points and inspiration from the big two. Most 3rd party RPGs are adding this in as well. This RPG is no different. In this game you get hooks. Hooks are one line descriptors that describe your character. This can be “I will never let an innocent suffer” to “if it doesn’t pay, I don’t play“. They don’t need to be noble or even nice, but they do tell the GM what you will do with your character. When you follow these hooks you get action points. Action points let your character cheat: raise your target number for your roll, become proficient in a skill, or whatever you might dream up. It’s pretty simple, and doesn’t need much explanation, but this does make me happy to see this added to another system. Vitality-Vitality is your hit points. What’s interesting about this is that as you lose vitality, you also gain negatives. I’ve taken a few hits in my day, and as I take a hit, I wear down. Lose a percentage of your vitality; you gain a -1 to all tests. Lose more vitality, and you gain more penalties to all your target numbers. “More than none, ready to run” isn’t realistic, and I appreciate the gradual reduction in your abilities when you get hurt. How about some more Shadow, Sword & Spell? Basics– How about some more Shadow, Sword & Spell? Now ON EXPERT MODE! Expert is the truest definition of a splat book. It’s just more of the stuff you want for your S, S&S game. Expert adds rules for everything from managing a kingdom to making new monsters. Expert also adds to the world and expands on the places you can conquer, explore, and control. And more Shadow, Sword & Spell, but this time it’s the monster manual! Basics– Every good game needs a monster manual. Sure, Basic had a small one, but here are a ton of different threats (see what I did there!) to throw at your players. Been listening to a ton of SR5 podcast and this matrix program came to mind…. Why work apart when you can run together? If you have three marks on another runner in the matrix, while this program is running that character is allowed to use all your marks as if they were their marks. Price– $150! at Amazon-Good Luck anywhere else! 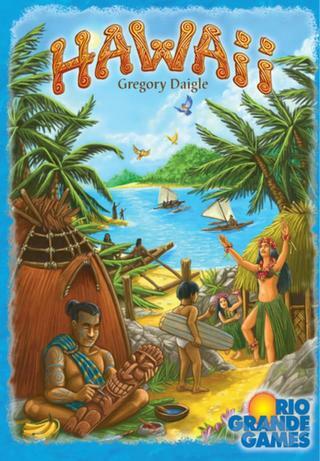 http://www.amazon.com/Rio-Grande-Games-469RGG-Hawaii/dp/B007515EVC/ref=sr_1_1?ie=UTF8&qid=1421289771&sr=8-1&keywords=hawaii+board+game or FREE at Board Game Arena! Basics-Are you ready to become the big Kahuna? In Hawaii, players battle to see who will be the next best chief. Hawaii is a game with several different sides to it. The main goal is most points. There are a few ways to go about that though. Each player has several different villages that they can grow to score points at the end of the game. To get points for each village, it has to be long enough to reach the tiki for that column it reaches and have a Kahuna at its start on the beach. For now, just think you have to have a start point marker as well as a distance marker for the villages. To get village tiles, the players take turns gathering people, places, gods, and resource tiles from the main island. This main island has several different buying tiles that are separated randomly into three rows. Each turn during set up, you randomly select different cost tokens for each tile. The last buying space on each tile will show the maximum total cost to all these tokens. If you ever draw a token that would put the total cost over the maximum cost, then that token is flipped upside down and placed in the fishing lagoon as all tokens have a cost side and a fishing side. Cost tokens are also placed on all the order selection spaces besides the first one. This game has a two sided economy for these tiles. You have to play to move to a place with feet and pay to buy things at a tile with shells. To move to a tile, it costs feet. To stay on a tile, costs feet. To go back to the beach is free. Players then go in turn order moving to the tiles and buying what’s there by moving onto one of the cost tiles and placing that location in one of their villages on their own player board. Therefore, cost tokens limit what can be bought each turn. Further complicating things when you buy a tile, you can decide to pay double the cost of the cost token you moved to. If you do this, you buy the more amazing side of the tile for the location. The more amazing sides reduce costs, give your extra points, give you extra money, and in general are better. At the beach players can use boats (something that you can buy from a tile) to go to the islands. These islands give you point as well as locations and money to spend. Also at the beach players can use boats to get the fish tiles that were placed in the lagoon earlier. And finally, players can move on to the turn order track to determine next turns order. While this seems pretty simple, what compounds this is the spending requirements for each round. Each round a token indicates how much players have to spend to get more points. Whoever spends the most gets more points, second most gets slightly less, and then anyone who at least spends the minimum gets a point amount too. However only the token and fish tokens you have count for this spending requirements! Thus if you spend double to get the better version of a tile, it only counts for the original amount. This massively increases the strategy of the game as buying the most expensive thing might backfire in a large way, and deals are an even more amazing values you have to really look for. After all players are on the turn track, the round ends, players get points if they spend enough, the turn spending token indicates how much money everyone gets for the next round, and new spending tokens are placed on all the different buying locations. At the end of the fifth round, players count up points from their villages, and the player with the most is the big Kahuna and next chieftain of the tribe! I got a present for Christmas. No it wasn’t from Red Rider, but it was an air rifle. Funny thing about air rifles, the Austrians used to use them to fight the Nazies. Maybe it’s not that bad a weapon. Here are my stats for it. An air rifle is not a weapon that will take down your average dragon. However, if you aim right and know what you’re doing, you can do some serious damage. When you make an attack with an air rifle, if you were hidden when you made the attack you are still hidden. The weapon normally does 2S damage. However, if your target glitches his or her dodge roll or is unaware of the attack, the damage of the weapon is 5p.